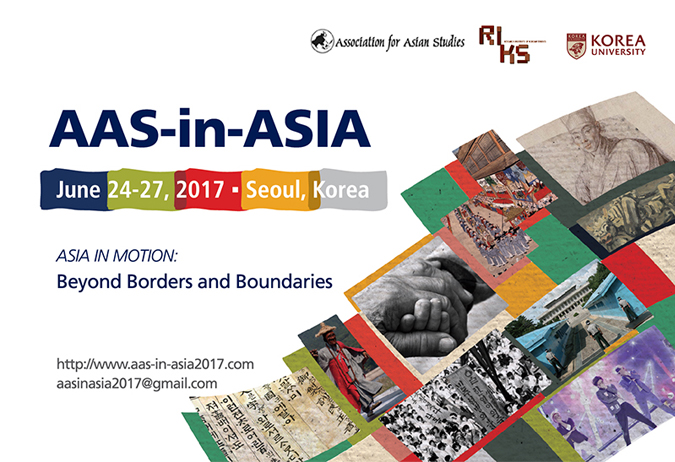 The Korea Foundation supports the 'AAS-in-Asia 2017' conference to be organized by the Association for Asian Studies (AAS) and Korea University from June 24 to June 27, 2017 at Korea University in Seoul, Korea. The conference is the fourth AAS-in-Asia conference AAS organizes in a Asian country. Around 1,200 Asian studies scholars and graduate students from 35 countries will participated in the key note speech, 175 pannels and 4 special roundtables of the conference under the theme "Asia in Motion: Beyond Borders and Boundaries". The Korea Foundation also organizes a special roundtable on "Korean Studies Past, Present, and Future: Moving Beyond Boundaries Towards Multi-Disciplinary, Transnational, and Alterative Approaches", in collaboration with the Research Institute of Korean Studies, Korea University. The special roundtable will examine the evolution of Korean Studies from multi-generational, transnational, and cross/multi-disciplinary perspectives to understand the historical evolution of Korean studies and discuss the possibilities for the future. KF는 아시아학 관련 세계적 권위의 최대 학회인 아시아학회(Association for Asian Studies/AAS)가 2017년 6월 24일(토)부터 27일(화)까지 서울에서 개최하는 『2017 아시아학회 아시아 학술대회(AAS-in-Asia 2017)』를 지원합니다. 2017년 아시아학회 아시아학술대회는 「유동하는 아시아: 경계와 영역을 넘어(Asia in Motion: Beyond Borders and Boundaries)」를 주제로 기조연설, 175개 패널 및 4개의 스페셜 라운드테이블을 운영하며 35개국 1,200여 명의 아시아학자들이 참가할 예정입니다. KF는 동 학술대회의 기조연설 세션을 지원하고 AAS 및 고려대학교 민족문화연구원(한국 측 공동주관처)와 공동으로 『KF 스페셜 라운드테이블』(2017.6.26. (월) 16:10 / 고려대학교)을 개최합니다. 「한국학의 과거, 현재와 미래: 경계를 넘어 학제적, 다국적, 대안적 접근으로의 이동(Koean Studies Past, Present, and Future: Moving Beyond Boundaries Towards Multi-Disciplinary, Transnational, and Alternative Approaches)」라는 주제로 개최되는 KF 스페셜 라운드테이블에는 미국, 영국, 캐나다, 일본 등의 유수 한국학자들이 참여하여 해외 한국학의 발전 과정 및 향후 나아갈 방향에 대하여 논의하게 됩니다.